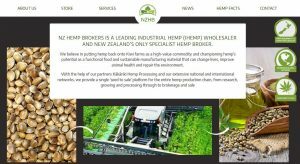 The new NZ Hemp Brokers website is live. The website is intended as a one-stop shop for information, advice, support, products and services that span the entire industrial hemp production chain. NZ Hemp Brokers Director Chris Woodney says as a leading industrial hemp wholesaler and New Zealand’s only specialist hemp broker, the company is keen to be a source of truth, support and expertise for the industrial hemp industry. “We’re passionate about the positive difference hemp can make as a sustainable farming crop, nutrient-rich food source, and highly versatile fibre for construction, clothing and myriad other textile uses. “Our ‘seed to sale’ approach means we are involved in all stages of the production process and using all parts of the hemp plant, from the roots to the tip. “We’re thrilled to have a website that allows us to really showcase the rich history of hemp, its benefits and potential, as well us the support, products and services we can offer,” Mr Woodney says. Visitors to the website can access facts about hemp, it’s history, uses and benefits, as well as information about growing hemp, from legislative and licensing requirements to crop yield and financial returns. There is also information about the services and support NZ Hemp Brokers’ offers. These include consultancy and brokerage services, workshops and media commentary, as well as hemp processing, which is managed through partner company Kakariki Hemp Processing. Andrew Bell, from sister company Kakariki Hemp Processing, says the new website also offers growers access to sale and hire of hemp processing equipment, including seed sorters, seed cleaners, bottling machines, oil machines, de-hullers and pallet extruders. “Offering hemp processing equipment for hire allows New Zealand farmers to test the value hemp can add to their existing farming operations, without the need for significant investment in processing machinery,” Mr Bell says. The new NZ Hemp Brokers website also features an online store where people can purchase beauty products and balms, animal products, hemp foods and hemp seeds. This includes NZ Hemp Brokers’ latest product offering, No Promises Hemp Seed Animal Oil Plus, which is a natural ECS animal health and wellbeing supplement. The website will continue to be updated to reflect the changing political and social environment surrounding, and increasing demand for industrial hemp and hemp products – watch this space!